Fort Frostmoth is the primary Imperial settlement on the south coast of Solstheim, in the Hirstaang Forest. It holds services (trader, smith, Imperial Cult altar) that can only be used if you have started the Rebellion at Frostmoth quest, due to low morale among the troops. It is also the main link to Vvardenfell by way of Khuul. 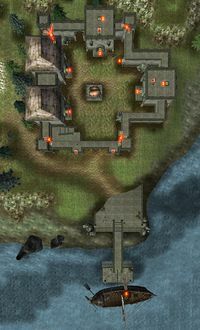 The makeup of the fort has the main barracks against the west wall; this is where you will find Captain Falx Carius and the prison cells as well. The Imperial Cult shrine is to the north. To the east, the armory also holds the fort chaplain's office. The fort is known among the legionnaires as a punishment detail, due partly to the unpleasant weather and partly due to the mead. The presence of wolves, bears, berserkers and rieklings probably doesn't help morale either. Fort Frostmoth also acts as the area office of the East Empire Company, located on top of the Imperial Cult shrine. The company was established here to mine the rich deposits of ebony from Raven Rock. Establish the Mine: Starting out on the quest to build the Raven Rock colony. A Blocked Door: Get a crazy Nord to leave the villagers alone. Missing Supply Ship: Search for a missing shipment scheduled to arrive at Raven Rock. Making a Choice: Take sides to either make the colony succeed or fail. Setting up Shop: Help Falco/Carnius decide which shop to build. To Catch a Thief: Track down who is stealing ebony ore from the mine. Aiding and Abetting: Help Carnius and Uryn to smuggle ore out of the Raven Rock mine. Supply Route Problems: Deal with a shipper who is demanding extra payments for delivering some ebony ore.
Bar Brawl: Calm down an old man in the bar who is picking fights with everyone. Race Against the Clock: Deliver a report quickly to Carnius in Fort Frostmoth. Stop the Messenger: Intercept a report from Falco for Carnius with the help of Hroldar. Razing the Forest: Take care of some Spriggans that have begun attacking the colony. Hiring Guards: Find some guards to protect the colony. Under Siege: Protect Raven Rock from a fake Skaal attack. The Assassin: Carnius requires your skills in the assassination of Falco. Drastic Measures: Help Carnius Magius plan an attack to slaughter the occupants of Raven Rock. The Moon Sugar Mystery: Investigate some jolly poisonings. The Missing Missionary: Track down this wayward teetotaler.